This entry was posted in Race Updates on December 11, 2008 by WSG. The gang from Wasatch Running Center is putting on a much needed spring trail race in Riverton, Utah. Looks like we get to run on a military base called Camp Williams in the south end of the valley. If you need a good warm up for Squaw Peak 50 here’s your chance to join Milada Copeland and Darrell this May 23 to run the inaugural Sapper Joe 30k or 50k on beautiful Camp Williams. This entry was posted in Race Results on December 7, 2008 by WSG. Yes sir, one of the best trail runners ever shows up at the North Face Challenge to take the cash, his closet rival Ulli Steidl was unalble to hold off the surging Matt Carpenter who still has the leg speed. 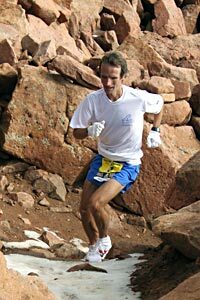 I ran Pike’s Peak Marathon the year those two had a show down on Matt’s home turf, guess who won that race??? Congrats to Matt and Kami Semick for taking the prize… 3 scrapes!! Good to see Kyle still has some competition out there, nice run Karl Meltzer who just finished the AT Adventure!! Secret Stash Sale – Up To 25% Off At Backcountry.com. Expires 12/16/2008 at 11:59PM MST. This entry was posted in Race Updates on December 5, 2008 by WSG. Talk about a show down for the money,…Tomorrow in San Francisco the big dogs are sprinting for the cash!! With Karl Meltzer running the event he posted hid usual savvy odds but now there is a late entry, Matt Carpenter!! Wow Ulli Steidl, Kyle Skaggs, Mike Wardian.. This is going to be a barn burner…stay tuned. Speedgoat 50k registration is open! This entry was posted in Race Updates on December 2, 2008 by WSG. It’s time to set the race calander for 09 ! The Speedgoat 50k is ready to take applications as of December 1st. The Speedgoat 50k…2009 version will be held on the 18th of July. One week earlier than last year. I’d like to see more snow on the course! Yah, just kiddin’. The course will be the same as 2008, unless some random circumstance happens. Applications will be available Dec. 1st, 2008, online at Active.com at 7am EST. The cost will be 70 bucks across the board. No early fee, no late fee, but you have to get it in by July 5th, nothing will be accepted after that as the registration page will be pulled. We are limiting the entries to 200 this year, so put us on your calendar and come run the toughest 50k in the US, (and probably the world). Snowbird has a great venue for runners and families alike, great rooms and activities for everyone ages 5-100.